Empire Division welcomes new officers at Salvation Army Adult Rehabilitation Centers in Binghamton and Syracuse. Albany’s volunteer, Deeon Fields, is a strong connection between her community and The Salvation Army. Mary’s plan of moving from North Carolina to Rochester to live with a friend didn’t work out and she became homeless and alone. Homelessness is an anxiety filled situation with many different issues that wrap together to keep a person from succeeding. One student from the Lockport Salvation Army shares her story of how The Salvation Army helped her family. The Salvation Army Genesis House provides shelter to homeless and runaway youth in the Greater Rochester area. Happy Anniversary to The Salvation Army. 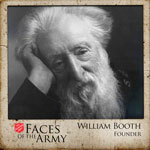 The Founder of the Army, William Booth was a Victorian era visionary and his legacy continues today. For our Faces of the Army today, we reprint an article about William Booth that was published in The War Cry on March 27, 2004. When a person is homeless, it means more than not having adequate housing. Poverty affects all of us. Each time we help a family or a child rise out of poverty, we are helping our entire community.